Most dishes can be adjusted separately in both directions. Every day, the sun moves across the sky. At one point during each day, it is shining directly from the same direction than the Satellite. The aim of this web site is to give the exact time for when the dish must be turned around its vertical axis to point directly towards the sun. 1) A line in the middle of the dish dividing the it from top to bottom can be imagined (vertical mirror axis). This line can be found by drawing a perpendicular or by using marks and screws in die middle of the dish. On the middle line on top point A must be marked and in the lower part point D. s. Drawing. 2) A line or bar (dotted line) must be fixed exactly on top of the dish (point A). 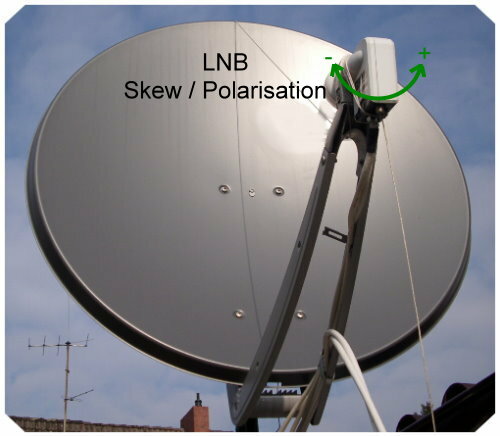 3) The second end must be fixed in the middle of the LNB (receiver = point B). 4) At the time given by this webpage the dish must be turned in east-west direction so that it points to the sun. This is the case when the line/bar casts its shadow exactly on point C.
5) Now this axis is exactly adjusted and can be fixed by the screws. The line/bar should be removed. In the easiest case this axis can be adjusted according the manual by using a scale. On the dish. 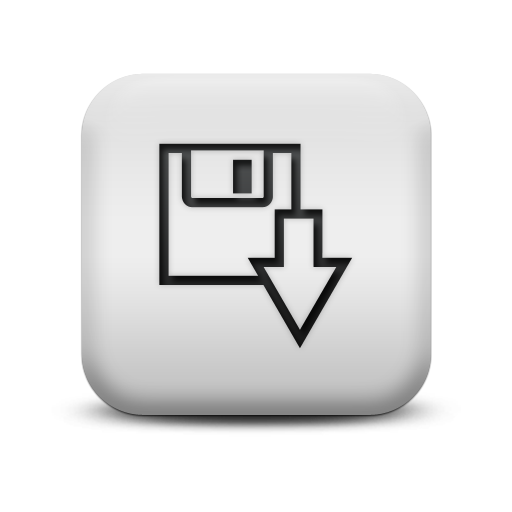 If this isn’t working properly the following steps can be taken. 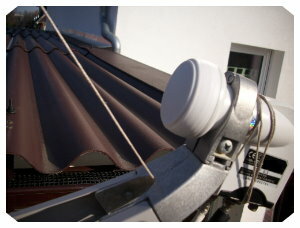 The following work can be carried out before mounting the dish. 1) This Webpage gives the elevation of the satellite over the horizon = angle Beta. This angle will be drawn on a 10cm x 10cm cardboard (blue) as shown in the drawing below. A line/thread must be fixed. 2) The line must be fixed be a finger to the middle of the LNB (receiver). The cardboard must be displaced along the middle line until the line is in parallel to the angle Beta. 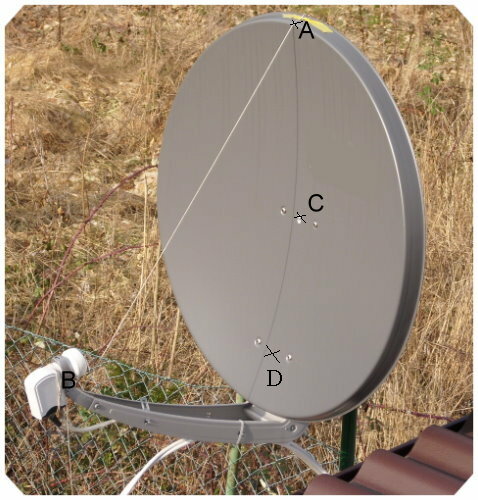 3) In this position the middle of the cardboard is pointing to point C. It should be marked at the rear side of the dish. 4) After mounting the dish, it must be turned around the horizontal axis until the tangent at point C is vertical. This can be verified by using a water level. 5) Now this axis is exactly adjusted and can be fixed by the screws. Ready. The result is given in wintertime. If the clocks are currently giving summertime, one hour must be added to the result.